The content of this article provides interesting facts and information relating to the History of the Colosseum. Our perception is perhaps that gladiatorial combat started with the Colosseum which able to stage elaborate and organised combats between hundreds of gladiators using various fighting styles. This perception is incorrect. Gladiatorial games started in Rome over 300 years before the Colosseum was built. The Colosseum did not exist during the lives of many of the most famous Romans such as the dictator Julius Caesar and Mark Antony. Neither had the Colosseum been built during the reigns of emperors such as Augustus, Tiberius, Nero, Caligula or Claudius. We have to look back before the Roman Colosseum was actually built to gain an insight into the history of the Colosseum and why the terrifying Arena of Death was ever built. The scale of the Gladiatorial Games increased from just a small number of participants to the massive numbers of gladiators seen in the spectacles of Roman Colosseum watched by up to 80,000 people. The History of the Colosseum. The History of the Colosseum began in Rome when the first recorded gladiatorial fight was staged in 264AD. Decimus Junius Brutus Scaeva put on a gladiatorial combat to honor the memory of his deceased father who was a consul named D. Junius Brutus Pera. Three pairs of slaves, selected from among 22 prisoners of war, were chosen to fight. The first gladiatorial fight took place in the Forum Boarium, a cattle market, situated near the Tiber between the Capitoline, the Palatine and Aventine hills. As this was the funeral of a prominent aristocrat and held in a public space, the event was likely to have drawn a large crowd. This first Gladiatorial combat was a clever idea as it also brought political prestige to their family¹s name. So the history of gladiatorial combat and therefore the Colosseum is related to a funeral. The History of the Colosseum. Why does the History of the Colosseum and gladiatorial combat relate to the Roman funeral, what was the connection? The religion of the Romans revolved around the worship of various gods and goddesses and their belief in the afterlife. Romans believed that human sacrifice at the dead person's funeral would appease the pagan gods and ensure a satisfactory entrance into the afterlife. Earlier customs of sacrificing prisoners on the graves of warriors or aristocrats were followed by Romans. Ceremonies connected with the dead lasted for nine days after the funeral, at the end of which time a sacrifice was performed. The Romans believed that "souls of the dead were propitiated by human blood..." Preparation for Roman funeral rites involved captives or slaves being bought, trained to kill and then sacrificed during the funeral rituals. This funereal ritual, or sacrificial ceremony, was called a munus - a duty paid to a dead ancestor by his descendants, with the intention of keeping alive his memory. At these ceremonies slaves or servants attended the funeral dressed as Pluto or Charon who were the gods of the dead. The god Charon ferried the dead across the Styx and an attendant, playing the role of Charon, symbolically carried away the bodies of the dead gladiators during the religious ceremonies. This symbolism was transferred to the Roman Colosseum when dead gladiators were escorted by a figure depicting Charon from the arena. The History of the Colosseum. The first gladiator fight was so successful that Roman aristocrats soon copied the idea. These funeral games, or munera, were held annually or every five years for the purpose of keeping the dead person's memory alive. The events grew bigger and more elaborate and at the funeral of P. Licinius Crassus, who had been Pontifex Maximus one hundred and twenty gladiators fought and funeral games were celebrated for three days; at the end of which a public banquet was given in the forum. Prominent Roman families competed against each other to produce the best games. What had started with Decimus Junius Brutus Scaeva organising three matches as funeral games transformed into public performances. Those organised by Julius Caesar, on the death of his daughter Julia, featured 320 paired gladiator matches. The History of the Colosseum. The history and concept of the Colosseum grew from the custom of funeral games. The funeral games were organised as public events by wealthy Roman aristocrats and Patricians. The Gladiator games were popular with the 'mob'. At first gladiator games, or combats, were held in small wooden arenas. The word “arena” means sand, a reference to the thick layer of sand on the floor for the purpose of soaking up the blood. But as the popularity of the games grew large amphitheatres were built to house the games. The amphitheatres were round or oval in shape. Their design was taken from joining two half circle wooden theatres together (the word "amphi" means 'both sides'). The most important amphitheatre, prior to the Colosseum, was the first stone built amphitheatre in Rome which was called the Amphitheater of Statilius Taurus. It was built in 29 BC, on the Campus Martius, by consul Titus Statilius Taurus in the time of the Emperor Augustus. This amphitheatre was quite small and in order to placate the plebs the Emperor Nero built a much bigger, wooden, amphitheatre called the Amphitheatrum Neronis in 57AD. Both of these amphitheatres were completely destroyed in 64AD due to the Great Fire of Rome. Initially the provision of Gladiatorial Games was seen as a method to please the Roman gods and avert Rome from disaster. The Romans who were responsible for staging such events grew in popularity, so the 'games' became political events by which prominent Romans could gain popularity with the mob. By the first century A.D. providing gladiatorial games even became a requirement of some public offices. It was not long before the concept of a permanent stone arena was born which would become known as the Colosseum. The History of the Colosseum. The terrible reign of the Emperor Nero and the burning of Rome led to Civil War. The turmoil ended when Vespasian became emperor. Vespasian founded the Flavian dynasty, so called because all of the Emperors of the Flavian dynasty bore the name Flavius. After the death of Nero morale and the confidence of Roman citizens was at an all time low. Vespasian had to get support back from the people. His idea was to demolish the palace of Nero and construct a permanent arena designed as a massive amphitheatre for housing free gladiator games and other entertainment for the amusement of the 'mob', the Plebs. The palace of Nero was called the Domus Aurea (Latin for "Golden House") and was a large landscaped portico villa. The construction of the 'Flavian Amphitheatre' started in c70AD. The Colosseum was originally called the the Flavian Amphitheatre. The original name of the Flavian Amphitheatre was given due to it being built by Titus Flavius Vespasianus (Emperor Vespasian) who founded the Flavian dynasty. It was soon given the name Colosseum which was taken from the Latin word 'colosseus' meaning colossal. This was in reference to the gigantic statue of the Emperor Nero which had been previously erected near the site of the Colosseum. This statue of Nero, believed to have been cast in bronze, measured 100 to 120 Roman feet (37m) high and had become a landmark in the centre of the city of Rome. The History of the Colosseum. The Colosseum would become a symbol of the might, the wealth and the power of the Roman Empire. Construction started in c70AD and was financed from the proceeds gained from the Roman sacking of Jerusalem. The successful campaign against Judea was ordered by Vespasian and led by his son, Titus. The Colosseum took less than 10 years to build, a remarkable achievement for the excellent engineers and their famous engineering skills. The architecture of the Roman Colosseum illustrates their use of one of the Romans most famous inventions - concrete. The Emperor Vespasian died on 23 June 79 and never saw the completed Colosseum. In A.D. 81 Emperor Titus dedicated the Colosseum in the city of Rome. The History of the Colosseum. Many Roman Emperors enjoyed the spectacles that the Colosseum had to offer and many of the gladiatorial games were financed by the emperors themselves. The history of the bloody arena continues through the reigns of various emperors, the emergence of the new Christian religion, the horror stories of the deaths of Christian martyrs in the Colosseum, the Gladiator fights and the killing of thousands of exotic animals in Ancient Rome. There was even an Emperor who took great delight in participating in the gladiator games held at the Colosseum - the Emperor Commodus. Commodus was the Emperor featured in the Russell Crowe movie Gladiator. The Roman Emperors and the Colosseum played a huge part in the history of the Persecution of the Christians. The Gladiatorial games at the Colosseum ended during the reign of the Emperor Honorius. Stilicho had defeated the Goths at Verona in June 403, it was the last Roman victory, and it was celebrated by the last Roman triumph followed by Gladiatorial games in the Colosseum. In the midst of the bloodshed a voice was heard bidding it to cease in the name of Christ, and between the swords there was seen standing a monk holding up his hand and keeping back the blows. There was a shout of rage, and he was stoned to death by the outraged 'mob' and killed. It was found that he was an Egyptian monk named Telemachus. 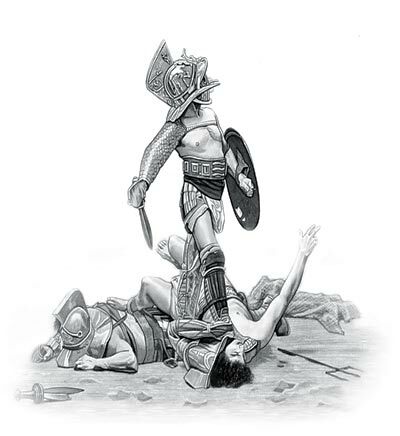 The death of Telemachus put an to gladiator combats. Chariot races and games went on but the terrible sports of death and blood were ended for ever. The last known gladiatorial fight in the Roman Colosseum therefore took place during the reign of Honorius. The Emperor Honorius, finally decreed the end of gladiatorial contests in 399 AD. The last known gladiator competition in the city of Rome occurred on January 1, 404 AD. The Sack of Rome occurred on August 24, 410 when the city was attacked by the Visigoths, led by Alaric I. The Roman capital had already been moved to the Italian city of Ravenna by Honorius, after the Visigoths entered Italy. The Visigoths destroyed many of the aqueducts leading to Rome. Without a fresh supply of water the city could no longer function. The Romans fled from the city - the glory days of Rome were finished. The History of the Colosseum. The History of the Colosseum moves on to the amphitheatre falling into decline. The outer walls were stripped of marble and even the iron cramps were removed and used to make weapons (the holes left in the Colosseum can be seen today). The Colosseum had various uses from housing vagrants to providing shelter to animals. Uses included housing, workshops, quarters for a religious order, a fortress, a quarry and as a Christian shrine. Today the glory days of the Colosseum have returned - the number of visitors and tourists to the Colosseum is estimated at over 5 million per year, all interested in the terrifying history of the Colosseum. The content of this History of the Colosseum category on life in Ancient Rome provides free educational details, facts and information for reference and history research for schools, colleges and homework. Refer to the Colosseum Sitemap for a comprehensive search on interesting different categories containing the history, facts and information about Ancient Rome. The History of the Colosseum.